I openly admit that I have a positive bias towards Lea Salonga from years of listening to her as the singing voice of Jasmine in Aladdin as well as seeing her as Kim, her signature role in Miss Saigon. Before attending Allegiance, the new Broadway musical in which she stars, I was prepared to enjoy whatever she did, even if it meant singing the phone book or reciting limericks about fishing. I knew it was about how, after Pearl Harbor was bombed, the United States government rounded up 120,000 Japanese Americans and put them into internment camps, taking them from their homes and businesses until such time that the powers that be were satisfied that their allegiance was with the U.S. It sounds like a depressing topic for a musical, but other good musicals have been made about WWII – Cabaret and The Sound of Music being the first that come to mind. I was worried that the show would be a static lesson that would be preachy and full of self importance; what I discovered is a powerful and bold new work that brings history to thrilling life. Allegiance tells the story of the Kimura family (grandfather, father, son, and daughter) who own and operate a farm in Salinas, California. We meet them in 1941 during what could be criticized as an over idyllic scene with the song and dance number “Wishes on the Wind,” but anything would seem wishful fantasy after they are forced into an internment camp with ramshackle buildings, no stalls in the bathrooms, flea and rodent infested bedding, and lack of adequate water and food. Many of the Japanese Americans lived like this until the end of the war four years later, and they were interrogated as to whether their allegiance was with Hitler and their Axis-overrun homeland or with the United States, the same country that robbed them of their livelihoods and strip-searched them in public, a horrifying experience for anyone but even more so for a people for whom modesty is a core value. Some of the younger men in the camp want to enlist to prove that their loyalty is with the U.S., while their families are understandably horrified that their kin would choose to support a country who had so egregiously wronged them, in such a way that what was done wrong could never be made right again. As to expected, Lea Salonga as big sister Kei is a delight with her singing voice every bit as bright and winsome as ever; it is her acting though that really drew me in to this piece as her character has so many different notes to play as the kind of peacemaker in her family. Telly Leung as her kid brother Sammy is a bundle of energetic delight, my first time seeing him live in a lead role. Mr. Leung is handsome and quick on his feet, with a determination as Sammy to prove his patriotism that actually made me think of Stockholm Syndrome, where victims feel sympathy and a kind of dedication for their captors above and beyond themselves. His sparring with Ms. Salonga and Christopheren Nomura as their father rings true and surely represents the dilemma experienced by so many Japanese Americans during the war. As events unfold, the individual Kimura family members grow in such a way that the question of their “allegiance” is not so easy to pinpoint and define; they see that not all Americans are weary of them, most notably Hannah, played by Katie Rose Clarke with gangly humor and awkwardness, as a nurse who befriends the family and tries to help them. Her role as a love interest for Sammy might seem only contrived if it wasn’t so deftly and honestly performed. George Takei plays the dual role of grandfather Ojii-chan as well as the older Sammy in opening and closing scenes that frame the show. Mr. Takei, who was in an internment camp as a child, plays the two roles quite differently – one is of an open and accepting immigrant and the other is of an elderly man disillusioned by war. Mr. Takei is adept at playing both sides of the coin and works well with the ensemble, not one to allow his star power to derail the storytelling or encite undue attention, as is also the case with Ms. Salonga. The supporting cast is also without fault, but it seems such shame to me that we rarely get to see these performers on Broadway outside of roles where being Asian is a main element of the plot. There is a trend in musicals ever since Rent where the sound design favors volume over clarity, often too loud without enough separation between voices and the orchestra; what it creates is an unpleasant burst of cacophonous noise, at times unintelligible and discordant with what is going on in the show. Sound designer Kai Harada avoids all of that here with sound that is clear and crisp, where even ensemble numbers have distinct lyrics that can clearly be understood (no small feat). The proficiency of the technical and creative team doesn’t stop there as Howell Binkley’s lighting, Donyale Werle’s sets, and Alejo Vietti’s costumes create an alchemy that looks and feels authentic, evoking the early 1940s without going overboard. This is not a musical full of bright, saturated colors; those flashes of color appear at very specific moments, such as in the tree in the opening “Wishes on the Wind” scene, and other scenes are appropriately muted and grayish with subtle swatches of violet and navy. The backdrops have moody, dark projections of the bleak landscape, and shafts of light stream through boards in the ramshackle internment camp walls; you’d think it was an exaggeration if only it weren’t real. A lot of credit for the handsomeness and effectiveness of this production deserves to go to director Stafford Arima for his vision and concept, but not giving a shout out to the exemplary efforts of his team would be a crime; they represent some of the best of what Broadway has to offer. The book by Marc Acito, Lorenzo Thione, and Jay Kuo (Mr. Kuo is also is responsible for the sweetly stirring music and lyrics) is cleanly focused, quite direct in pointing out facts about the living conditions of the internment camp while also bringing to life the story of a non traditional family working through its own issues as they deal with a country that has made them prisoners. I almost wrote “concentration camp” there but caught myself; in reality, these internment camps were just as horrible as those Nazi chambers of death that we and the rest of the Allied forces were fighting against in WWII. While the characters are understandably aghast at being imprisoned, they still want to be in this country and thought of as Americans. After all, they immigrated here and created families, businesses, paid their taxes… People don’t generally do that if they want to bring about death and destruction to the country on whose soil they have built their livelihoods. And yet, this isn’t an anti-American story or show at all; if anything, it is a statement against stereotypes, racism, and ignorance. It’s clear that the Japanese should not have been treated in such a fashion simply because they looked like the enemy, but it was a time before television, the Internet, and so much globalization of the news. That’s not to excuse the actions of our government, but it is easier for me to understand such a radical move in that time than it would be today, when one has to actively choose ignorance when so much information is available at our fingertips. That’s why the statements of some notable Republicans currently vying for the Presidency concern me deeply; their sentiments sound a lot like the uninformed masses that allowed the internment of the Japanese in this country during WWII. The only way to fight against such ignorance and fear is with education and enlightenment, and that’s what I found in Allegiance, a show that brings a story about parents and children and siblings (who doesn’t have all or some of those?) forced to choose between a rock and a hard place with neither option being ideal or even slightly fair. I suppose the ultimate success of a show relies on its ability to move people; if it can do that, be it towards laughter or tears, then it has accomplished something more than what might be found on a balance sheet. 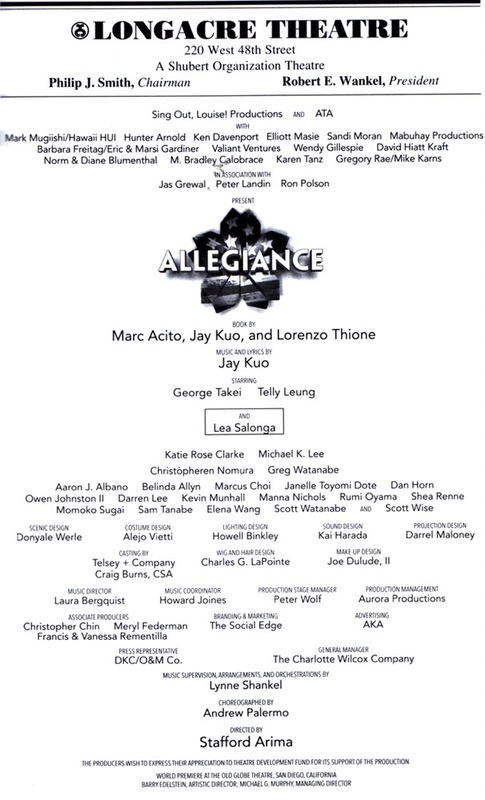 That thought brings to mind the song “Higher” that Ms. Salonga sings near the end of act one of Allegiance. As her voice and the music continued to build, I noticed some peripheral movement to my right. I glanced over, expecting to fly into a rage at someone for checking their cellphone or unwrapping something loudly; what I saw was the married Asian couple seated next to me join hands. That small, silent gesture affirmed for me the quality and importance of a piece like Allegiance, one that connects with the heart to tell a story about our history – not to indict or assign blame, but to remind us so that we never forget lest it happen again. I can only hope that this play enjoys a healthy life in regional and community theatre after its criminally short Broadway run ends. Bravo!